Mizuki is a Japanese-American track-and-field star who transfers to a high school in Japan too be close to her idol, the high jumper Izumi Sano. To facilitate this dream, Mizuki disguises herself as a boy and gets accepted to an all-guys boarding school. As fate would have it, Sano and Mizuki are more than classmates, they're roommates! Now, Mizuki must keep her secret in the classroom, the locker room, and her own bedroom while her classmates and teachers, including the weird school nurse, must figure out how to handle the new transfer student who is too pretty to be a boy. 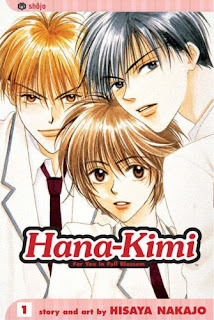 Hana Kimi is a complete 23 volume series that is one of the more entertaining and well-drawn mangas I’ve read. There is plenty of humorous tension as Mizuki tries to maintain her male facade and lots of awkward situations that will have readers snickering into their manga. This manga manages to succeed where many fail by staying true to the characters and limiting itself to the realistically ridiculous rather than going completely beyond belief. Readers may stretch their suspension of disbelief but they won't have to completely disregard it.